The man who died was actually a doctor himself. 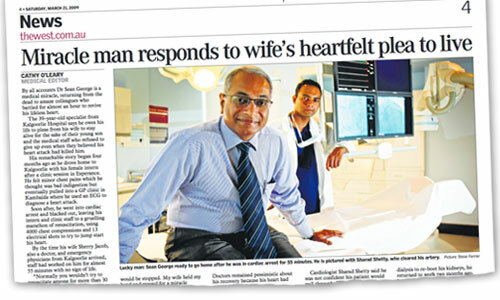 39-year old Sean George worked as a specialist doctor at Kalgoorlie Hospital in Kalgoorlie, West Australia. On October 24, 2008, Sean was traveling from Esperance, Australia to Kalgoorlie after a training session, when he started experiencing chest pains. The persistent pain finally forced him to pull into a medical clinic in Kambaida about a half-an-hour out of Kalgoorlie. An ECG test showed Sean was having a heart attack. Shortly after the test, George’s heart completely stopped (cardiac arrest) and the intern who George was traveling with and clinic staff tried to resuscitate Dr. George. They worked on him for one hour and ten minutes and then finally pronounced him dead and stopped all intervention except air to the lungs. By this point, they had given Dr. George 13 electrical shocks and compressed his heart about 4,000 times. But there was no sign of life. Ten minutes after they stopped, his wife Sherry, who is also a doctor, arrived at the clinic with emergency staff from Kalgoorlie. Sean George was already blue. The doctors told Sherry her husband was dead and she should give her last good byes. As soon as she prayed, Sean gasped and his heart begin pumping. The startled doctors gave him medication to stop any clots and called for an emergency plane to fly him to a larger hospital. But doctors were convinced there was little hope since his heart had not functioned for nearly an hour. After 3 minutes without oxygen, the brain starts dying and is dead after 20 minutes. Even if George lived they expected massive brain damage. Then the emergency flight to the Royal Perth Hospital was delayed an hour because of a hail storm. George finally arrived at the hospital four hours later where medical staff immediately performed emergency surgery to unblock an artery. But doctors were not optimistic because of how long his brain was without oxygen. Dr. George presented his own healing testimony to the World Christian Doctors Network’s annual meeting held in Brisbane, Australia in 2011. This year’s conference is scheduled for Sofia, Bulgaria, May 9 – 10, 2014. In some ways, Dr. George’s testimony reminds me of when Jesus raised Lazarus from the dead recorded in John 11:1-44. The similarity is not only in how a dead man was resurrected, but also in the delays seen in both miracles. When it was first reported to Jesus that Lazarus, who was the brother of Martha and Mary, was sick, Jesus delayed going to them stating simply, “This sickness is not to end in death” (v 4 NASV). Though we are not told how grave Lazarus’ illness was, there must have been some urgency in the message for Jesus to say what He did. Despite the seriousness, Jesus delayed a few days before going to Bethany where Martha and Mary lived. By the time Jesus arrived, Lazarus had been dead four days, suggesting he probably died shortly after Martha and Mary sent their note. When Jesus arrived Martha obviously upset by Jesus’ delay said, “Lord, if you had been here, my brother would not have died” (v 21 NASV). Jesus and the family traveled to Lazarus’ tomb. Jesus ordered the tomb stone rolled back and after a simple prayer cried out, “Lazarus, come forth.” (v 43 NASV) and Lazarus stumbled out of the tomb. When Jesus prayed to His Heavenly Father just before raising Lazarus from the dead, He said, “that they may believe that You sent Me” (v 42 NASV). This also applies to Dr. George’s miracle.